Much to our surprise a few days ago we spotted this 24 foot, 1954 Silver Streak trailer at Cedar Breaks National Monument near our home in southern Utah. I couldn’t resist pulling into the parking lot in an attempt to talk to the owners. It had California plates, so I asked around for a while trying to find the owners but without luck. Just as I was about to give up, a couple walked toward the trailer and opened the door. It belongs to David and Allison Page from Mammoth Lakes, CA. David and his family were very friendly and didn’t mind at all showing off their trailer. It seems they found it in Hatch, NM some ten years ago. David told me he hadn’t done very much to it in the way of repairs. He said they use it all the time and were on the way to Ojo Caliente, NM to visit family. I didn’t spend too much time visiting with them as they were about to get going and I had an appointment to make about 50 miles away myself. As I drove away I thought of several questions I should have asked, but that’s the way it goes. It was nevertheless an enjoyable encounter. 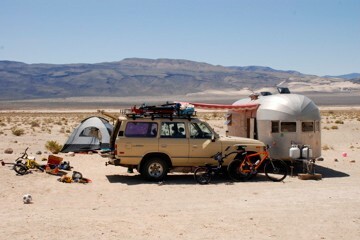 After this post, I received an email from David Page telling about a story he wrote a couple years ago--dragging the old Silver Streak out to Eureka Basin, Death Valley, N.P. Follow this link - Writing and driving notes from 1000 RPMS. Thank you David, we enjoyed your story and wanted to share it with others.